When you’re looking for a gift for that special someone in your life it can be a little hard to know what to get. Technology items like new phones aren’t romantic, even if they are practical. So what are you supposed to buy for the woman that you love? One of the best gifts for almost any occasion is vintage jewelry. No matter what style the woman you’re buying for likes, you’ll be able to find something very unique and special when you shop for vintage jewelry pieces. Best of all, you can even look for vintage jewelry online, so there’s really no limit to the amount of pieces you will be able to find. Before you can really start shopping for vintage jewelry you should pick the type of piece you want. Are you looking for a bracelet, a ring or maybe a watch? Whatever you’re looking for you need to narrow down your search parameters. Otherwise you’ll be looking at too much stuff to make up your mind. Perhaps the biggest reason to choose vintage jewelry as a gift is because you’re giving something that is completely unique and not really like anything else out there on the market. Vintage jewelry, unlike many new pieces, are also imbued with a sense of history since they have been worn before. 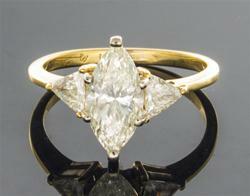 If you’re buying particularly old pieces of jewelry, say from the Victorian era, that charm is amplified even further. Some vintage pieces even come with information about who owned them and where they were worn.